A fitness brand posted the video on Instagram the day before Halloween. Emojis go from the keyboard to the court: Because slam dunking a basketball on a 10-foot hoop isn't hard enough. A video by a fitness brand showed a group of men playing basketball wearing emoji costumes. One of the men, wearing a blow-up poop emoji costume, is shown dunking on a group of other men wearing costumes. The Lost Breed, a Connecticut-based fitness brand, posted the video to Instagram the day before Halloween. It has thousands of views. The second clip shows the man in the dinosaur costume dunking with one hand. 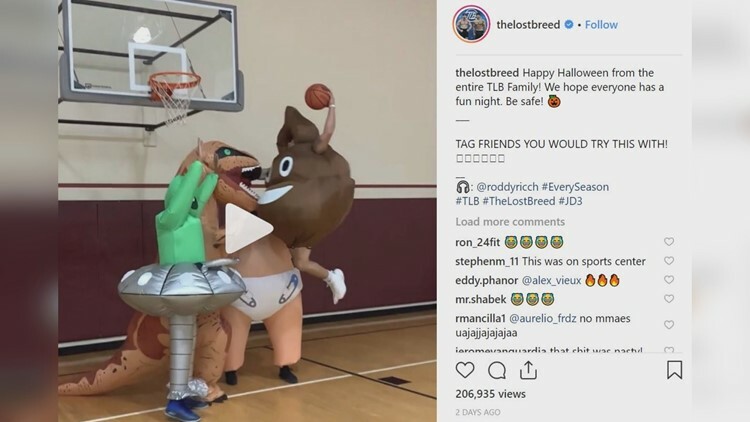 The third clip shows an alley-oop slam from the man in the Tyrannosaurus rex costume to the man wearing the poop emoji. The fourth clip shows the man in the poop emoji costume dunking on the Trump baby costume. The fifth clip shows the man in the poop emoji completing a two-handed slam. And in the final clip, there's a tip drill from the dinosaur to the alien to Captain Underpants to the poop emoji, who throws down the dunk off the glass. Celebration ensued.